So I’m working on another more substantive post, but first I just had to share this anecdote, even though it makes me look like kind of a total moron. Lucy woke up in a great mood, I fed her and we had our morning “conversation.” (She has started doing all sorts of awesome “ahs” and “goos,” Sometimes she even strings them together into what sounds like a complete sentence!) 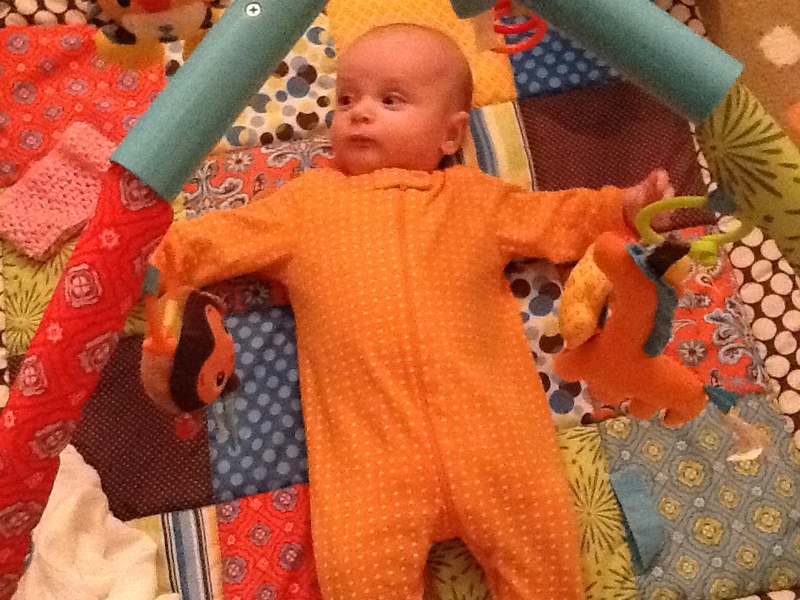 Anyway, then we moved to the nursery for some play time on her activity mat. Lucy loves being on her back and looking up at the dangling animals. Tummy time, not as much. I’m supposed to be putting her on her tummy at least twice a day but it doesn’t always happen. So I decided that I may as well try it when she’s in a good mood and hope for the best. What I didn’t think about — hello, Captain Obvious — was how little time had elapsed since her meal. Lucy was doing a great job, lifting her head off the mat and not fussing, and I was laying next to her rubbing her back, when — BLECH! — out came the biggest spit up I have ever seen onto the activity mat. Then, before I could stop her, Lucy dropped her face smack into the middle of the giant spit-up puddle. Evidence of Lucy’s nonchalance: this photo was taken right after I cleaned her up. I, on the other hand, remain somewhat traumatized. I won’t be making that mistake again!